This week at CVS (until 4/18) Purex are Buy 1 Get 1 Free. There is a Buy 1 Get 1 Free coupon from coupons.com for SELECT zip codes. Check out coupons.com, enter you zipcode, and cross your fingers that your zip code is eligible for this fabulous coupon! After the coupon, you can get (2) Purex Laundry Detergent for FREE! If you are eligible, run to CVS to get your FREE Purex! 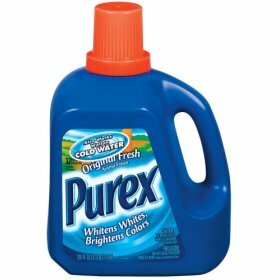 Purex is one of the top laundry detergents in my laundry detergent stockpile. Remember if your store is out of stock, ask for a rain check to use when they are re-stocked. is it the original Purex before they went to the double concentrate? I was a little nervous to try this one, but my lovely cashier Julie here in S.D., who is always super nice, gave me no problems, and I got my 4 FREE bottles of Purex!!! Thanks so much for the post!! So… the cashiers don’t give you problems with the 2 different BOGO ?? I’m anxious to try this one. I just don’t want them to hassle me! The computer will automatically deduct the price or do they have to manually do it? Just got back from CVS. I printed the coupons off 2 computers and got 8 free Purex’s! Well actually I paid 1.96 in tax. I’m stocked up for a bit! I dont understand how this works. Some people are saying they are getting 4 for free. I called my local CVS and they said you cant use a BOGO coupon when it is already BOGO. How are people getting 4 for free? So, how does a BOGO coupon work when the item is already BOGO? People are getting 4 for free if they have coupons. CVS is running a store promotion of Buy 1 Get 1 Free. So store promotions can be combined with a manufacturer’s coupon and they will be reimbursed by the manufacturer for the coupon. Your mileage may vary as some stores will say no because they don’t understand one is a store promotion and the other is a Manufacturer’s promotion. I’ve only had one time when a B1G1 Sale & B1G1 coupon didn’t work…and it wasn’t at CVS. Nice! I just printed it! Thanks! Jenny from Mommin’ It Up!s last blog post..Happy Tax Day; I hope you’re not as delinquent as I am.